Michael Pierce immigrated to the New World in the early 1640s from Higham, Kent, England to Scituate, in what later became Massachusetts. The ten year period from 1630 to 1640 is know as The Great Migration. During this period, 16,000 people, immigrated to the East Coast of North America. Captain Michael Pierce was the brother of the famous Colonial sea captain, William Pierce, who helped settle Plymouth Colony. Captain Michael Pierce played a significant role in the Great Migration. Historical records show that this one sea captain crossed the Atlantic, bringing settlers and provisions to the New World more frequently than any other. He had homes in London, the Bahamas and Rhode Island. He played a central role in the government of the early colonies. He was killed at Providence, one of the Bahama Islands, in 1641. Pierce Family Moves to Scituate. Michael and Persis Pierce's first child, a daughter, was born in 1645 and named Persis in honor of her mother. Unfortunately, their first child died in 1646 at one year of age. The new family settled first in Higham, but moved in 1676 to Scituate, where the Pierce family continued to reside for most of the next century. Scituate is located some 10 miles north of the original Plymouth colony. It was settled as early as 1628 by a group of men from Kent, England. Michael Pierce resided on a beautiful plain near the north river and not far form Herring brook. He assisted in erecting the first saw-mill. The mill was the first one erected in the colony. It is believed that Samuel Woodworth (1784-1842) wrote the song, "The Old Oaken Bucket," concerning this river and mill in Scituate. Samuel Woodworth's grandfather, Benjamine Woodworth (another relative of ours), witnessed the signing of Captain Michael Pierce's will, on January 1675. Unlike his famous brother, Captain William Pierce, Michael Pierce was not a sea captain. He attained the title, Captain, from the Colony court in 1669. Historical records show that he was first given the rank of Ensign under Captain Miles Standish, then later, in 1669, he was made Captain. These titles reflects his role as a leader in the local militia formed to protect the colony from the Indians. Captain Michael Pierce's memory is well-documented in American history. He is honored for the brave manner in which he died in defense of his country. The exact manner in which he died is repeated in more than 20 books and letters detailing the military history of the King Phillip's War. 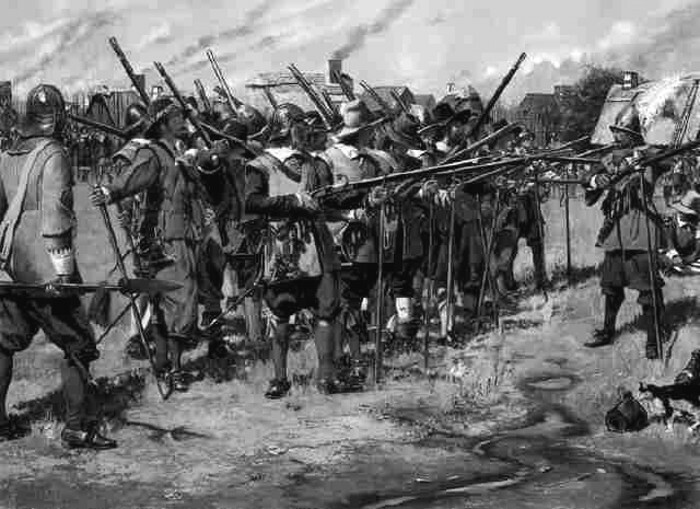 This war took place between 1675 and 1676, and remains one of the bloodiest conflicts in American history. It was also a pivotal point in early American history. 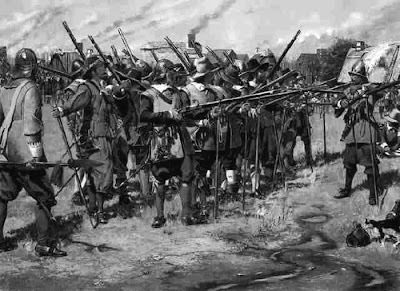 Although the English colonists were ultimately victorious over the Indians, it took the colonies over 100 years to recover from the economic and political catastrophy brought about by this conflict. "Sunday the 26th of March, 1676, was sadly remarkable to us for the tidings of a very deplorable disaster brought into Boston about five o'clock that afternoon, by a post from Dedham, viz., that Captain Pierce of Scituate in Plymouth Colony, having intelligence in his garrison at Seaconicke, that a party of the enemy lay near Mr. Blackstorne's, went forth with sixty-three English and twenty of the Cape Indians (who had all along continued faithful, and joyned with them), and upon their march discovered rambling in an obscure woody place, four or five Indians, who, in getting away from us halted as if they had been lame or wounded. But our men had pursued them but a little way into the woods before they found them to be only decoys to draw them into their ambuscade; for on a sudden, they discovered about five hundred Indians, who in very good order, furiously attacked them, being as readily received by ours; so that the fight began to be very fierce and dubious, and our men had made the enemy begin to retreat, but so slowly that it scarce deserved the name, when a fresh company of about four hundred Indians came in; so that the English and their few Indian friends were quite surrounded and beset on every side. Yet they made a brave resistance for about two hours; during which time they did great execution upon their enemy, who they kept at a distance and themselves in order. For Captain Pierce cast his sixty-three English and twenty Indians into a ring, and six fought back to back, and were double - double distance all in one ring, whilst the Indians were as thick as they could stand, thirty deep. Overpowered with whose numbers, the said Captain and fifty-five of his English and ten of their Indian friends were slain upon the place, which in such a cause and upon such disadvantages may certainly be titled "The Bed of Honor." However, they sold their worthy lives at a gallant rate, it being affirmed by those few that not without wonderful difficulty and many wounds made their escape, that the Indians lost as many fighting men in this engagement as were killed in the battle in the swamp near Narragansett, mentioned in our last letter, which were generally computed to be above three hundred." Monument in Scituate. Today, in Scituate, there is a Captain Michael Pierce Monument and a Captain Pierce Road.